Vingtor Decals Item No. 48-102 - Norwegian Trainers. Highly recommended – if you want a model that will stand out in a crowd, look no further. Vingtor Decals specialises in 1/32, 1/48 and 1/72 markings for Norwegian military aircraft from World War 2 to the present. 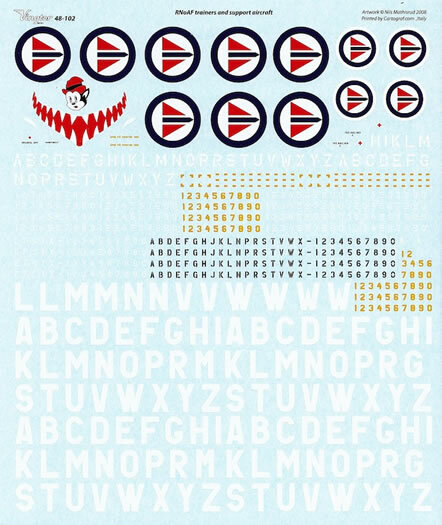 Their range covers front-line aircraft as well as less glamorous, but nonetheless fascinating, subjects such as those featured in this 1/48 decal sheet – the training and support aircraft used by the Royal Norwegian Air Force between 1946 and 1958. 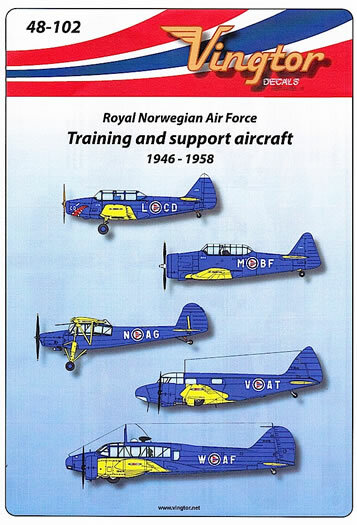 The defining characteristic of Norwegian training aircraft of this period was their paint scheme of a bright blue fuselage set off by equally bright yellow wings and stabilisers. According to Vingtor’s instruction sheet, this scheme was based on the famous United States Army Air Corps colours of the mid-1930s, and was introduced at the Norwegian flying school established in Canada following Norway’s defeat by Germany in 1940. 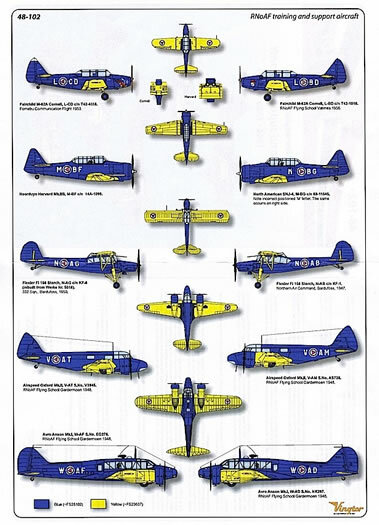 The combination of this vibrant colour scheme with some less-frequently modeled aircraft types is what makes this decal sheet so interesting. Fairchild M-62A Cornell: L-CD/T42-4118 of Fornebu Communication Flight, 1953 (which features a shark-mouth on the lower forward cowlings), and L-BD/T42-1018 of RNAF Flying School Vaernes, 1956. The only 1/48 Cornell kit available, so far as I know, is Planet Models’ resin Fairchild PT-26 – see the Hyperscale review here: http://kits.kitreview.com/planet175reviewse_1.htm. Noorduyn Harvard Mk.IIB, M-BF/14A-1099 and North American SNJ-4, M-BG/88-11545. According to the instruction sheet, the RNAF used 22 of these famous aircraft, mainly Canadian-built Harvard Mk.IIBs, but also a small number of North American SNJ-3s and -4s. In terms of available kits, my research suggests that modelers are restricted to the Ocidental Harvard for the Mk.IIB and the Monogram T-6 Texan for the SNJ-4, with both kits needing some tweaks to be spot-on in terms of accuracy. However, I’m not an expert in this field at all, so please forgive me if I’m wrong! Fiesler Fi 156 Storch: N-AG/KF-6 (rebuilt from W.Nr.5016) of 332 Squadron, Bardufoss, 1950, and N-AB/KF-1, Northern Air Command, Bardufoss, 1947. Most Allied nations employed captured Storchs, and the Norwegians were no exception. Here’s an opportunity for modelers to finish their Tamiya Storch in colours that will make it a real head-turner. Airspeed Oxford MK.II: V-AT/V3945 and V-AM/AS728, both of RNAF Flying School Gardermoen, 1948. The RNAF training scheme looks very stylish on the twin-engined Oxford, with the combination of blue engine cowlings on yellow wings adding yet another splash of colour. The recent release of the Special Hobby Oxford means modelers no longer have to rely on the old Sanger vacform if they want to reproduce this scheme. Avro Anson Mk.I, W-AF/EG276 and W-AD/NK297, both of RNAF Flying School Gardermoen, 1948. From my perspective, the Anson is the pick of the bunch here, and I think this will be how I’m finishing my Classic Airframes Anson when I get around to building it. Make sure you pick up the right version of the kit though – both of the Ansons represented here are early versions with the less-steeply angled windshield. Considering the brightness of the aircraft, it is a little suprising to see that – apart from the red, white and blue of the RNAF roundels – there is not a lot of colour on the decal sheet itself. All of the codes are white, while the serials are white, black or yellow. The sheet is printed by Cartograf, and the quality is what you would expect from that company – minimal carrier film and sharp printing, down to the perfectly legible Norwegian-language stencils. Enough roundels are supplied for the modeler to complete two of the featured aircraft, with plenty of codes and serials left over for future projects. he only difficulty I can see in relation to modeling aircraft from this decal sheet is that some of the subject kits are rare and/or out of production. However, they can be found if you want them, and this is definitely one of those sheets that gets you thinking about making models you would never have otherwise considered. While I can’t see myself building a fleet of Norwegian trainers, I’m now tempted to do at least one. At the moment it’s the Anson, but the Oxford also looks good, as does the Storch.